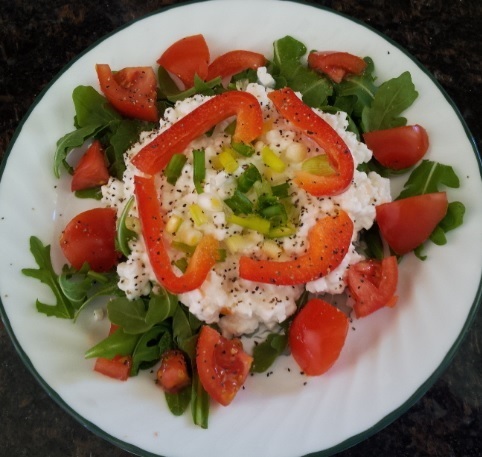 Now, please don’t say “ugh” or “yuck.” Even if you’re not a cottage cheese fan, you can put together a quick, healthful, satisfying lunch plate in five minutes using five simple ingredients of your choice. I used low-fat cottage cheese, arugula, a Campari tomato, some red bell pepper, and a scallion. You can substitute whatever you like, such as tuna in place of cottage cheese. 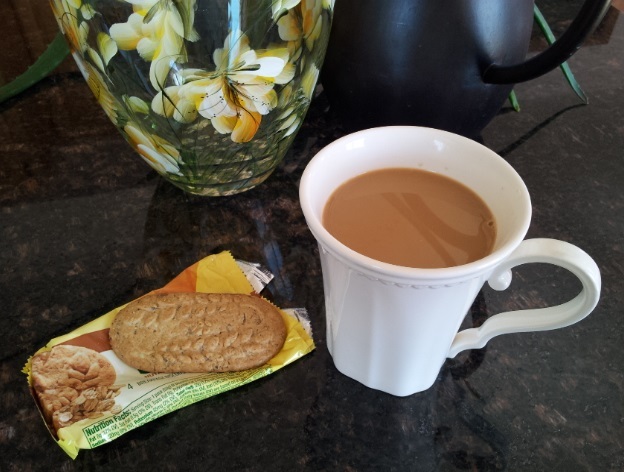 For “dessert,” I had one of my favorite coffees, Illy, with two belVita breakfast biscuits (I ate the other two in the packet for breakfast with my morning tea). This coffee is also a five-minute, five-ingredient “recipe.” I used Illy Dark Roast, a shake of cinnamon, and a splash of vanilla right in the paper cone of my drip coffeemaker. After brewing, I added Land o’ Lakes Lowfat Half & Half and some (OK, more than some) organic cane sugar. Although I like to cook, and have become somewhat addicted to watching cooking shows on TV, I usually confine my efforts to dinner–and usually when someone else is around to eat it besides me. So anything I can put together quickly for the other two meals is just fine with me.